Judge Brett Kavanaugh is a danger to workers. I’m the director of the Southern Maine Workers’ Center and one of the things we do is run a hotline for workers who have experienced injustice in the workplace. We talk to workers all over the state, who are desperately looking for support after something unsafe, unfair, or unlawful has happened at their workplace. The truth is, that a lot of the time there’s not a lot we can do for them. There’s a lot of unjust things that happen on jobs sites, and even when things are illegal, it can be really hard to get help. This is to say that conditions for workers right now are bleak we don’t have a lot of power and the power we do have is being corroded. The scale in this country is tipped toward employers and hard working Maine people need the scales tipped back toward them. Not further away. The one tool that workers have always had, for building power and creating better working conditions is taking collective action. That doesn’t have to be formal, like a union, but it could be. Collective action might just be a few of people writing a letter together to address an issue in the workplace. This is a lesson I learn years ago at one of my first jobs. I work delivering ice cream on a bicycle for a Ben & Jerry’s store—this is a longer story, but what’s relevant is that the manager there kept making homophobic remarks to me. I thought about leaving the job, but I really needed the money. I started talking about it with my co-workers, and found out that I wasn’t alone. The reality in most workplaces is that, if it is happening to one person it is almost always happening to all or most of your co-workers. As it turned out the manager had said racist things to one of my coworkers. So my coworker and I decided to write a letter to our manager’s boss. It worked. We got a new manager. Collective action is the best protection workers have. Now, that was all a long introduction to say this–the Supreme Court is not a friend to workers right now. And one of the things that is under attack is the right of workers to take collective action. Supreme Court Justice Nominee Brett Kavanaugh is lined right up with that agenda. In fact, he’ll make it worse. I know that both Senator King and Senator Collins understand themselves to be supporters of working people in Maine, and we need them to show that by voting against the appointment of Brett Kavanaugh. Here’s the deal. Who here is familiar with the Janus case? It’s bad, right? Janus is a recent Supreme Court case that ruled that public workers who are protected by a union can’t be forced by union dues. Meaning people can get all the benefits of being in a union without paying into the union that protects them. The ruling was huge blow to public workers that paints a grim picture of what’s to come for other workers. It’s likely that the Supreme Court will have an opportunity go one step further and apply the same logic to public sector workers. And it’s likely that Brett Kavanaugh would cast the deciding vote. As our entire country becomes a “right-to-work-for-less” state, we can anticipate lower wages across the board for all workers. And we can anticipate less ability for workers to address other injustices in the work place—whether that’s discrimination, sexual harassment, unsafe conditions, or better wages. Again, the court has already done some damage to the ability for workers to sue. A recent ruling, the Supreme Court decided that companies can require workers to settle employment disputes through individual arbitration, finding that employees should not always have the ability to bring claims through the courts. Last year Kavanaugh ruled against employees’ right to bring a lawsuit under the Occupational Safety and Health Act (OSHA). And he’s likely going to have the case to weigh in on the right of a groups or classes of workers to be forced into arbitration when he’s on the Supreme Court. Imagine the effect something like will have on workers in a large workplace who are facing the same problem… What could it mean in this #MeToo moment if women in a workplace were forced into arbitration, rather than getting together to sue their employer? The last example I want to give is the most egregious and worrisome. A group of workers in a meat packing plant in decided to organize for better working condition and they voted to form a union that the company refused to recognize. The workers took the company to court, in a case that landed in front of, you guessed it, Brett Kavanaugh. The company argued that the union wasn’t legal because undocumented workers voted in the election and their votes should not count. Fortunately, the rest of the judges relied on long standing precedent that the law covers all workers, regardless of immigration status. But, Brett Kavanough, in a lone dissent, sided with the employer, arguing that the law does not apply to undocumented workers and that the votes of undocumented workers should not have counted in the union vote. We cannot allow the dehumanization of immigrant workers or the formation of second class workers. This opinion is racism. Period. Senators King and Collins, must stand against the bureaucratization of racism and discrimination and refuse to support Brett Kavanough’s appointment. Working people deserve the opportunity to improve conditions in their work places, for themselves and their coworkers. We must protect the right to take collective action at work. We must continue to allow all workers, regardless of race, gender, immigration status, the opportunity to take collective action to address injustice at work. Allowing ideological judges to undermine those hard-fought worker rights is a disservice to all working people. 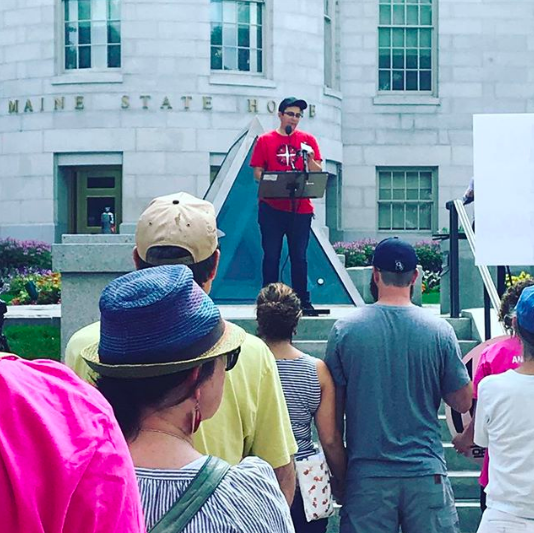 The Southern Maine Workers’ Center is a nonprofit membership organization committed to creating a grassroots, people-powered movement that improves the lives, working conditions, and terms of employment for working and poor people in Maine.